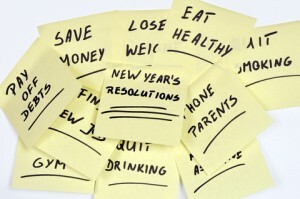 Home›Small Business›New Year’s Resolutions -- Forget About It! New Year’s Resolutions -- Forget About It! How many times have you promised yourself at the start of a year to lose weight, save money, eliminate debt, get organized, or undertake some other transformation that’s important to you? If you’re like most people (myself included), resolutions usually don’t work. According to a FranklinCovey survey some years ago, four out of five people eventually break their New Year’s resolutions, with one-third doing so by the end of January. Rather than simply making a resolution which you’re likely to break, create a plan that you can follow throughout the year. Whether the plan relates to marketing, employee training, or other activity in your business, or some personal growth endeavor (learning a new language, reading more, etc. ), setting out the steps you’ll follow can be an effective tool in seeing things through. Setting goals. Using a plan helps you create goals that are realistic and achievable. Without a plan, your goal may be pie in the sky. Steps to follow. Rather than face the transformation as a single idea, take things a little as a time. What can you do this month? Next? As the year goes on, you’ll see progress toward achieving the changes you want. Benchmark to check progress. From time to time, review your plan to see whether you’ve achieved the goals you’ve set for yourself. Reward achievements. Build into your plan a reward for meeting your goals along the way. Even a simple acknowledgment to yourself is a reward of sorts to recognize success. 43Things is a place to list your resolutions, share your progress, and cheer others on along their way. There’s an app for the iPhone. HabitForge helps you break or create a habit on the premise that it takes 21 days of repetition to be successful. There are daily email checks to help you. Habit Maker Habit Breaker is an iPhone app that has motivation reminders. I’d love to hear about your plans for change in 2012. Write me at Barbara [at] barbaraweltman [dot] com. Thanks and good luck.